How many times do I start one of these saying, “This was a really hard choice this week”? But it’s SO TRUE. This Friday, TCM is having a mini-marathon of WWII movies that feature strong female main characters. I had to fight with myself to narrow it down, but the one that won out really is amazing, is rarely aired and is absolutely worth having permanent residence on your DVR (or DVD library, TCM also sells it). A group of recently commissioned Army nurses is setting sail for a dream assignment – 2 years in Hawaii! But while they are still in the water, the Japanese attack Pearl Harbor. Now they destined to become combat nurses and their careers take them around the Pacific as they “follow the fleet” and go wherever they are needed, facing challenges that push them to their physical, mental and emotional limits. Claudette Colbert, Paulette Goddard and Veronica Lake lead the ensemble of about 10, with steely Colbert at the forefront. It’s hard to pin down a central story since all three of the nurses have their own story arcs, plus the supporting characters, and the movie as a whole takes place over many months and is set in multiple locations. But the actresses are masters and pull you along through the movie so that you don’t get lost in all the characters and stories. “So Proudly We Hail” is a composite work of fiction based on official records of actual Army nurses. So while the specific characters are fictional, the events they endure are all based on actual events. And as such, it completely covers the emotional gamut: there’s romance, there’s humor, there’s suspense, there’s tragedy. It also takes us around the Pacific. Once upon a time, I used to know a lot of Pacific and European geography because I grew up watching all these WWII movies.So that’s a double-bonus, in my opinion. So the narration is a little melodramatic, but the essence of the movie is well-represented here. And I absolutely LOVE this cast. Claudette Colbert is amazing, was a staple in WWII movies that needed a strong female lead and doesn’t disappoint here as the leader of this band of ministering angels. Paulette Goddard is one of my Top 5 Favorite Actresses, and this role is a perfect example of why, even though it’s not my favorite of her roles. I like her more in “Reap the Wild Wind” or “Unconquered.” Veronica Lake isn’t one of my favorites, but she has the most emotional character here as Olivia (IMO) and carries it very well. She will tear your heart out. 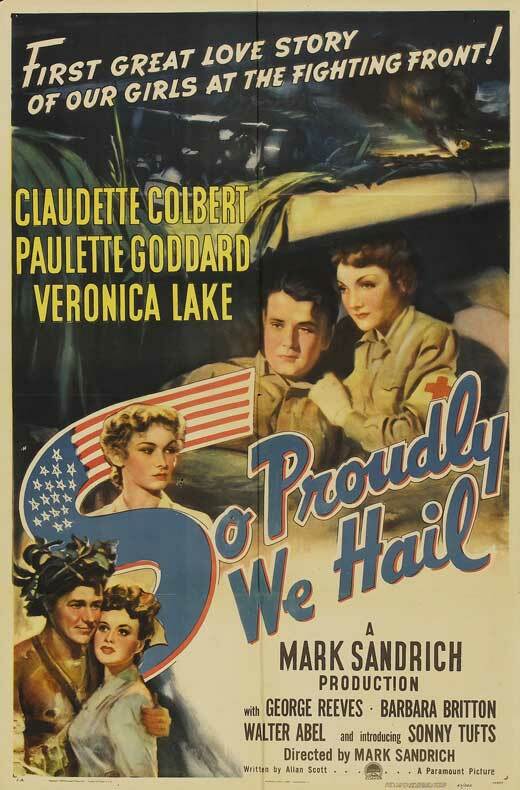 “So Proudly We Hail” will be on TCM on Friday, April 12, 7:00 pm CST. The nurse in me wants to see this! I read "We Band of Angels" which was a non-fiction book about the lives of combat nurses in WWII. I don't think their uniforms were as white as those pictures, but really interesting anyway.